2 Tbs. grass-fed butter, room temp. Trim tough ends of asparagus spears, place on baking sheet and toss with sesame oil, sea salt and pepper. Roast for 20-30 minutes, to desired doneness. Check after 15 minutes to turn spears. Preheat a medium sized skillet over medium-high heat. Salt and pepper the salmon. Make dill butter – combine butter, dill, garlic and lemon zest in a small bowl and set aside. Pour oil into heated pan, add salmon (skin side up), cooking for 4-5 minutes. Flip the salmon over, cooking for 4-5 more minutes. 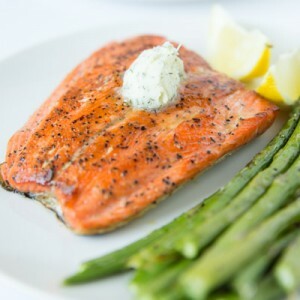 (cook time depends on the thickness and size of your salmon – salmon will turn opaque, be firm to the touch and reach 135°F). Remove salmon from pan, topping with the dill butter. Squeeze lemon wedges onto salmon, if desired.